This Breathing Decorative Mood Lamp is made of high quality ABS and silicone material, super soft touch, provides a 100% safe play environment for kids, no harm for your children, no need to worry about dropping it out. Energy saving ,led light lifespan is 100,000hours.Super long working time for about 8hours for one charging . Create a dreamlike atmosphere for you and your kids'room, suitable for bedroom, home display, gifts and other romantic places. * If you want to turn off the lamp, please press the main power button again, light totally turns off. 【Design】 -- The baby desk Decorative Lamp is make of super soft environmental silicone material, no need to worry about dropping it out. Suitable to be used as baby bedroom bedroom accessories and decor lamps. Note: please charge for it before use. 【4 Modes 】-- Turn on Warm White / First Tap White / Second Tap 5 colors fixed / 7 colorful changing mode.The warm white is suitable for sleep.You also can choose the favorite color and fix it.Or choose colorful lights changing mode. 【Sensitive Tap Control】 -- Just tap the surface to switch among color modes, one tap for one color switch, sensitive vibration sensor allows you to control lights at will. 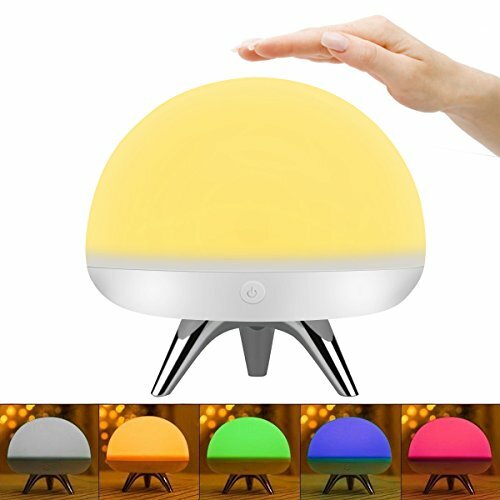 【USB Rechargeable Bedside Lamp】-- Built-in rechargeable battery, can be charged via USB cable, kids baby light can light up for kids to get a restful night sleep in babies room or baby desk , kids will not be afraid to go to sleep alone anymore. 【Ideal Gift for all】--Fabulous ideal gift for baby toy with lights, kids, girls, ladies and men . It can be used in the bedroom, children's room, study, living room, dining table. If you have any questions about this product by Intsun, contact us by completing and submitting the form below. If you are looking for a specif part number, please include it with your message.